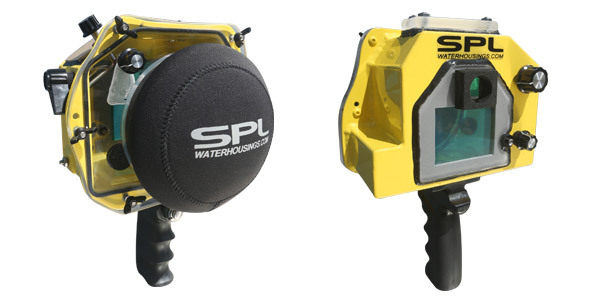 A-SERIES camera waterhousings are not dive housings, they are splash rated for water action sports only. Although not made for underwater diving photography, they are great water housings for photographing surfing, sailing, kite boarding, bodyboarding, fishing or many other shallow water activities. Housings are constructed of ultra light weight aluminum. Sheared, formed on a sheet metal press brake then welded solid by a certified welder. All aluminum is hard anodized to protect against salt water corrosion. The water housing is then painted with industrial powder coat paint. Each A-SERIES SPL Waterhousing is custom made to your needs, to receive a quote on your new water housing click below to fill out the short form and we’ll get back you in as little as 24 hours. All housings made by SPL can handle any size surf you have the nuts to swim into. These are not dive housings and they should not be treated as such.